Venture off the beaten track and explore what the diverse Port Douglas region with Blue Adventures. Our small group tours have an emphasis on viewing wildlife in the World Heritage rainforests, native grasslands and Outback wetlands close to Port Douglas. 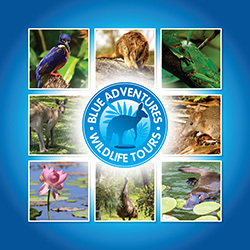 With a maximum of 6 guests per tour, a Blue Adventures Wildlife and Rainforest tour is the perfect way to experience the diverse range of landscapes close to Port Douglas and potentially see animals including kangaroos, emus, wallabies, endemic birds and, if we are lucky, the elusive platypus or rare Tree kangaroo. Our trips depart Port Douglas at 7:30 am and return at approximately 5:30 pm. We require a minimum of 2 guests to run a tour and our small group tours are not suitable for children under 10 years of age.